The humble fried dough pastry Churros has gained much traction in Singapore of late. Eaten as a snack or breakfast in Spain, found in Disneylands and amusement parks as carnival food, Churros have become very popular in Asian cities like Seoul. This is where the sticks can be filled with sauces of all kinds, or inserted in ice creams and desserts. 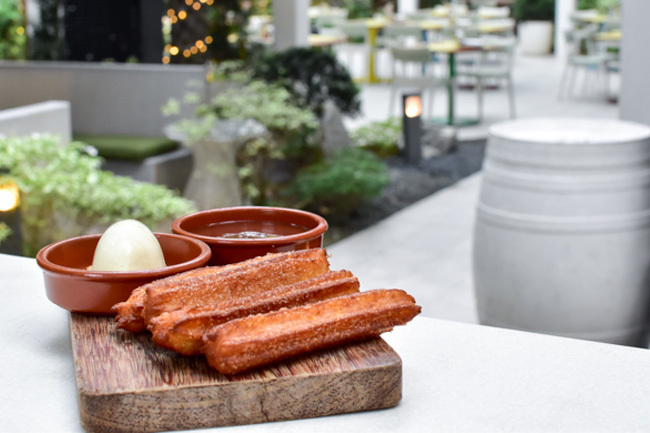 Some Singapore’s cafes and bistros have offered churros as part of the dessert menu; and we have also see whole shops dedicated to churros and ‘enjoyed’ 3-hour long queues. 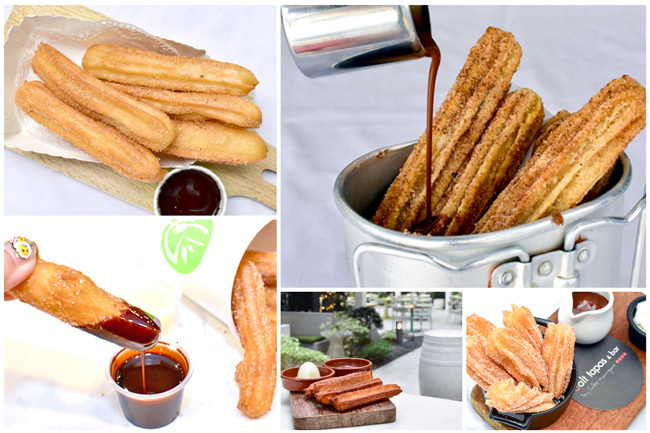 For the love of Churros, we went to search for the Best Churros In Singapore, and ate from more than 20 places. Common Man Coffee Roasters at Martin Road has built up a reputation for its coffee and bistro-quality food in a short manner of 2 years. Its sugar-dusted long 12cm Churros ($12++) has also been a popular must-order since Day 1 of the café’s opening. While we liked the churro’s crispy exterior, the doughy interior was kind of a let-down. However, the chocolate sauce all rich and velvety provided that extra ‘oomph’ that was seductively tasty. Hola! 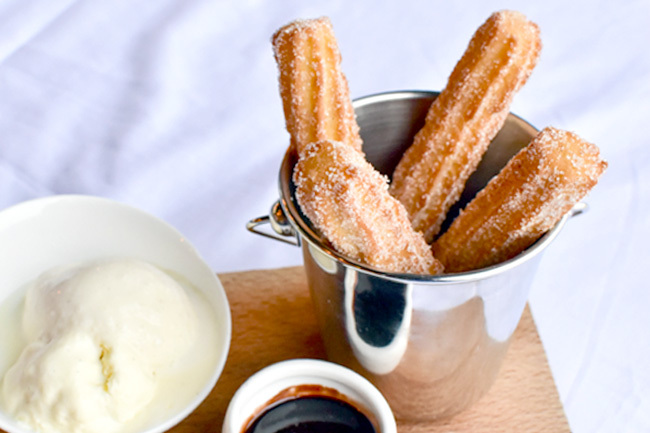 EVERYTHING here is made from scratch – the churro, ice cream, to the chocolate sauce. 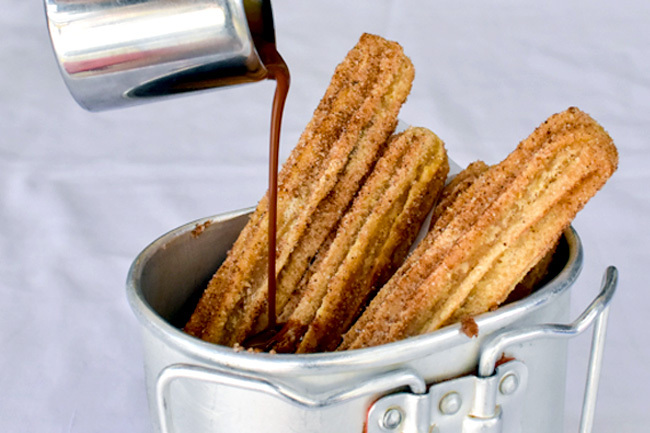 This Churro Con Chocolate ($14++) almost stole our heart. The star shaped churros were dusted generously with coarse sugar. Crispy exterior – checked; fluffy soft interior – checked. Although the churro was pre-made and fried upon order, there was no dense and doughy interior. The citrusy vanilla ice cream elevated the whole enjoyment, though we would have liked the chocolate sauce to be less watery. Churros with the element of romance. UNA at Rochester Garden is where many lovely couples would host weddings (and by the way, congrats Miss Tam Chiak!). The 15cm long Churros were served with dark chocolate sauce and honey ice cream. By far, the accompanying chocolate sauce was one of the best that I have tasted. In addition, the churros’ texture was crisp and airy, being raved by many. UNA was light handed on the powdering of sugar, and the cinnamon and other condiments went well together. Our main feedback was that the oil used tasted a bit stale. If not, this would have easily been one of the best churros that I have eaten in Singapore. Coffee is not the only star at Habitat Coffee, the eight crispy finger thin Churros ($9) adorned with generous serving of cinnamon sugar are an affordable and addictive treat. Dip into the chocolate sauce at the side for ultra-sweet experience. Being one of the pioneer Halal hipster cafes in the heartland area of Singapore, Butterscotch Cafe located at Bukit Merah Central was seen with an unceasing queue during peak lunch hours. The owner of Butterscotch Cafe has a passion for food, and insist that the chocolate sauce and churros ($11+) are all made from scratch. 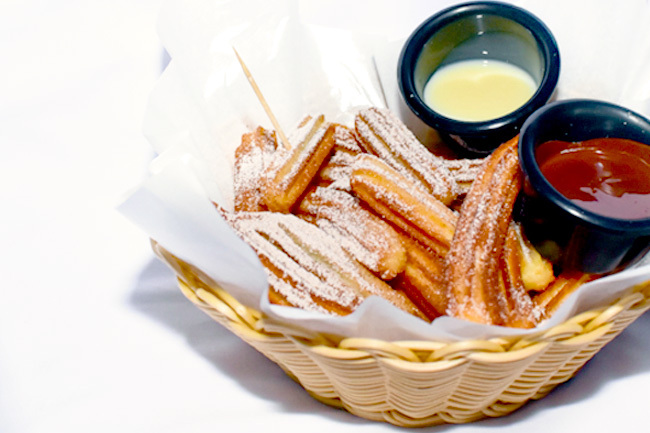 We thought that the chocolate sauce has a lovely malty taste that goes well with the churros. With cinnamon in the churro batter, Butterscotch’s version is set to appeal to lovers of cinnamon. 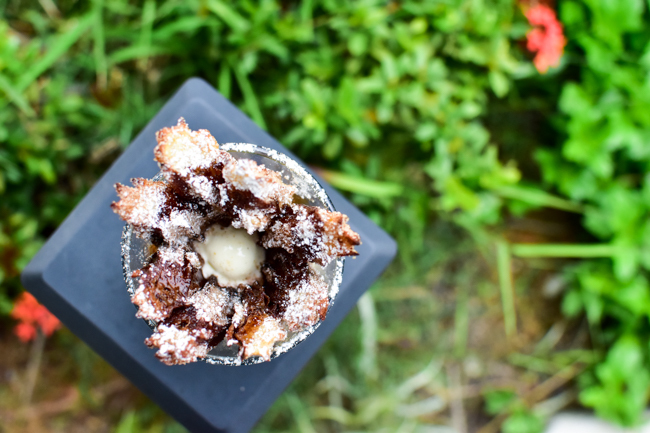 One of the most instagrammable churros, Craftsmen Specialty Coffee version ($10++) is pre-made and baked upon order. While there was a crispy exterior, the interior had a chewy doughy texture which some may akin to the nonya “kueh kueh”. One of the places that you will least expect to find churros, at the basement Food Republic Foodcourt, sold by a salad stall. Some may not be able to phantom how healthy salads and sugar-loaded churros can come together. The Saladicious serves one of the cheapest affordable churros ($3 for 5 pcs) in Singapore, without additional GST or service charge. Add on another $0.50 for a chocolate or condensed milk dip for a sweeter experience. Taste wise, okay loh. If you happen to be craving for something sweet after mid-night (or your partying hours), Alegro at Clarke Quay is opened till 3am to satisfy your midnight cravings. We liked the bite sized (28 pieces -$12++) finger thin pieces, chewy on the inside and crispy on the outside. 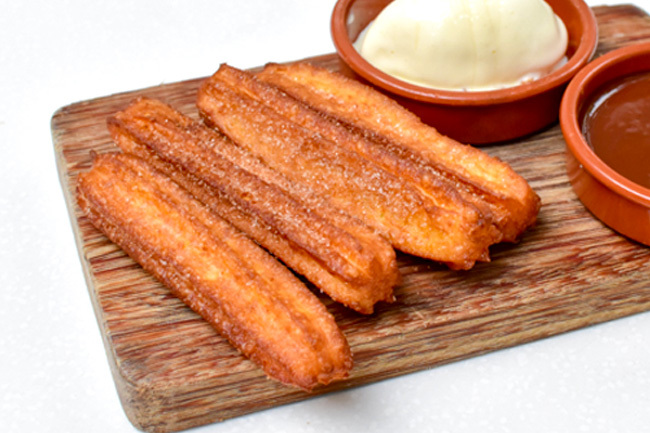 The hot crenelated (that means with ridges) churro ($14++) remind us of those in Barcelona, and we can almost imagine a stroll down buildings of Gaudi, munching on sticks of churros. With vanilla cream made from Madagascar vanilla pod and Valrhona dark chocolate sauce, resistance is almost futile. They are also available as an item on their weekday high tea set. 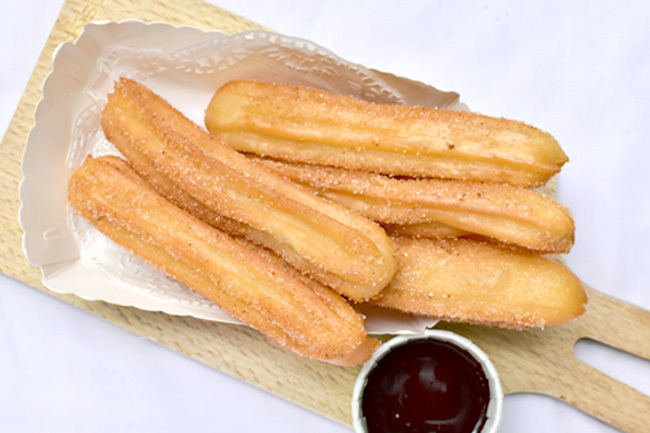 If one of the myths on the origin of churro is true, we say this churro ($12++) looks most similar to their counterpart from China. We love artisanal products made from scratch. The vanilla ice cream, chocolate sauce, and the churro batter are all made in house. 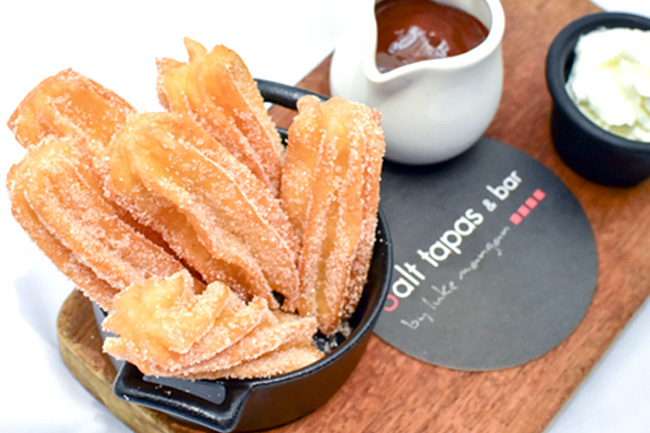 A strong contender for the best churros in Singapore. 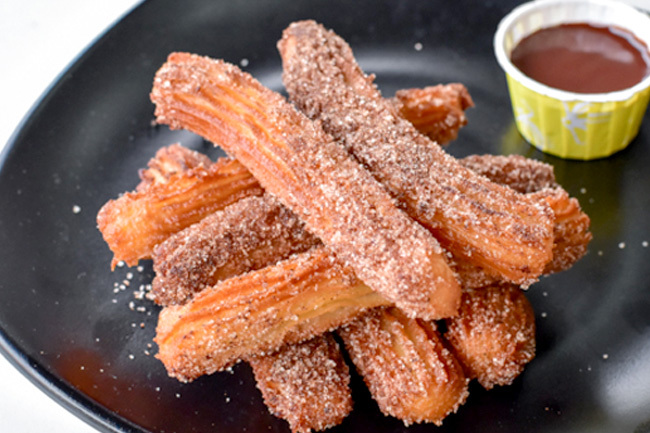 While Salt Tapas & Bar and UNA come very close in the race for title of best churro, Cafe Iguana’s version has the potential. Additional note: It will be good to call or check the Facebook of cafes for the availability of churros at their premises. We met with hiccups of different kinds – stock not arrived, super long waiting times, temporary closures, availability only on certain days, oil not heated etc etc. We are still on the quest of searching for a good churro. Let us know your favourites by commenting below. Till then Adiós! ← ThaiExpress – New Look, New Dishes, New Orange Card That Can Win You Trips To Thailand! Churros factory is the best! Craving for some crunchy fresh Cinnamon churros in Singapore? 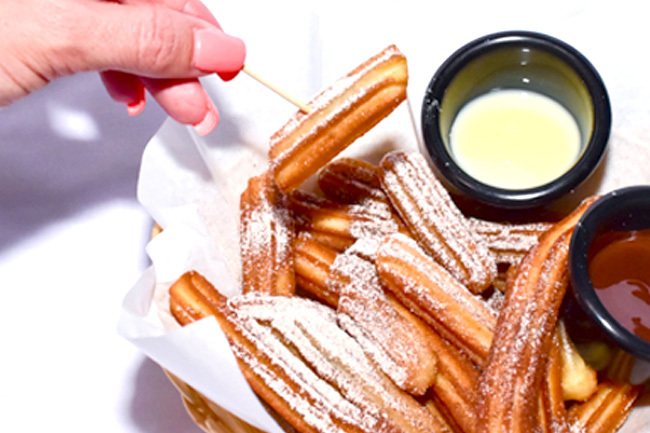 Come down to Baja Fresh Mexican Grill and try out our warm and crispy churros quoted with cinnamon churros. 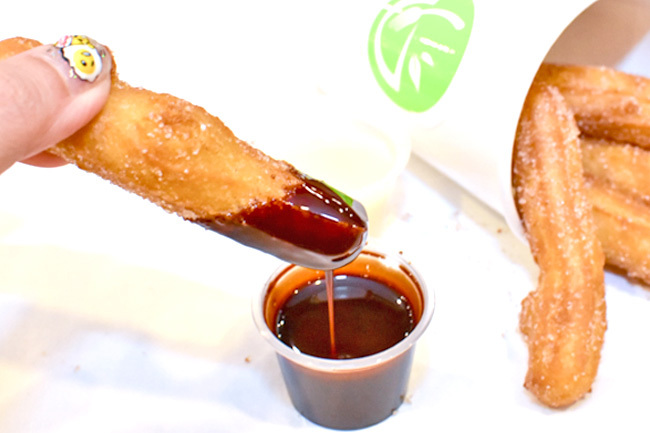 The crunchy cinnamon churros sticks chime perfectly when dipped in chocolate sauce. 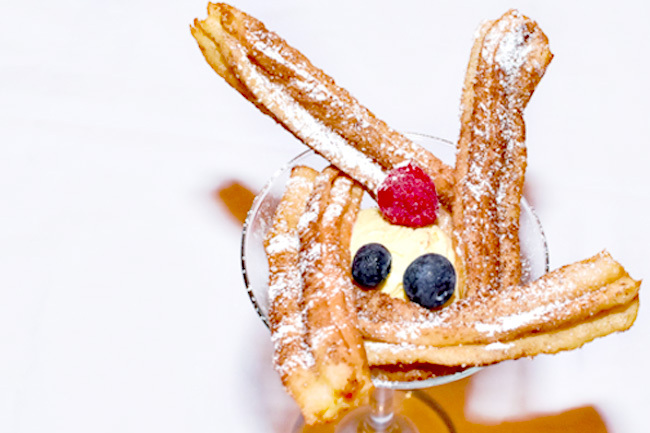 Customers can order Cinnamon churros for dine in as well as for deliveries and caterings. Know more about us at Baja Fresh mexican restaurant online. Under your review for the churros from Salt Tapas & Bar, I believe you mean to say “Gaudi” rather than “Gaugi”.